The Global Internet Forum to Counter Terrorism is holding its first workshop on August 1, 2017, in San Francisco, where representatives from the tech industry, government, and non-governmental organizations are coming together to share information and best practices about how to counter the threat of terrorist content online. Formed last month by Facebook, Microsoft, Twitter, and YouTube, the Global Internet Forum to Counter Terrorism formalizes and structures how our companies work together to curtail the spread of terrorism and violent extremism on our hosted consumer services. Building on the work started within the EU Internet Forum and the shared industry hash database, the GIFCT is fostering collaboration with smaller tech companies, civil society groups and academics, and governments. In addition to the founding companies of the GIFCT, more than two dozen other technology companies and NGOs will be participating in Tuesday's meeting. We also welcome United Kingdom Home Secretary Rt Hon Amber Rudd MP and United States Acting Secretary of Homeland Security Elaine Duke — as well as representatives from Australia, Canada, the European Union, and the United Nations — to discuss mutual areas of cooperation. We believe that the best approach to tackling online terrorism is to collaborate with each other and with others outside the private sector, including civil society and government. We look forward to further cooperation as we develop a joint strategic plan over time. This entry was posted in YouTube Blog, YouTube Blogs and tagged Global Internet Forum to Counter Terrorism, YouTube on July 31, 2017 by Stephanie Shih. Today we’re making it easier to manage the coexistence of Google Calendar and Microsoft Exchange Server (including Office 365) within your organization. We’re starting by supporting real-time free/busy lookups between the two systems within the same organization on both mobile and web. This has been a popular feature request from customers with hybrid G Suite - Microsoft Exchange environments. Once Calendar Interop is set up for your domain, end users will be able to see each other’s free/busy information across the two systems. This information will be available to users in Google Calendar’s Find a Time and Microsoft Outlook’s Scheduling Assistant. Calendar Interop works in real time and is supported on Google Calendar for Android, iOS and web. 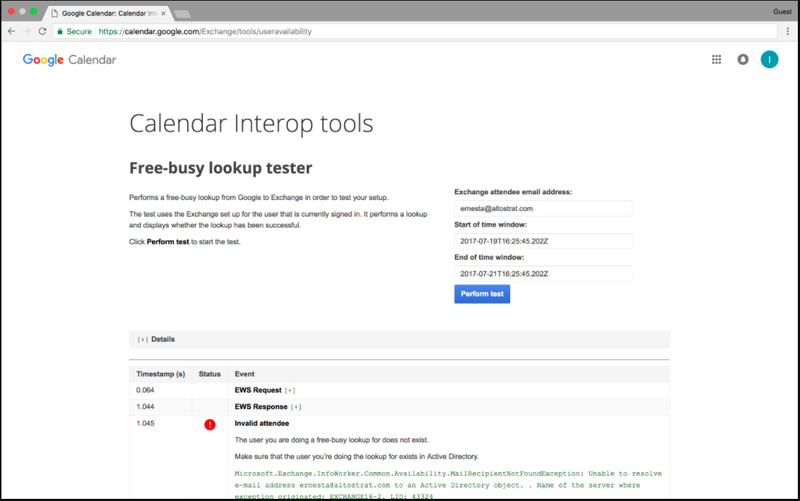 As G Suite admins, you can enable user availability lookups by visiting Apps > G Suite > Settings for Calendar in the Admin console and selecting Calendar Interop management. 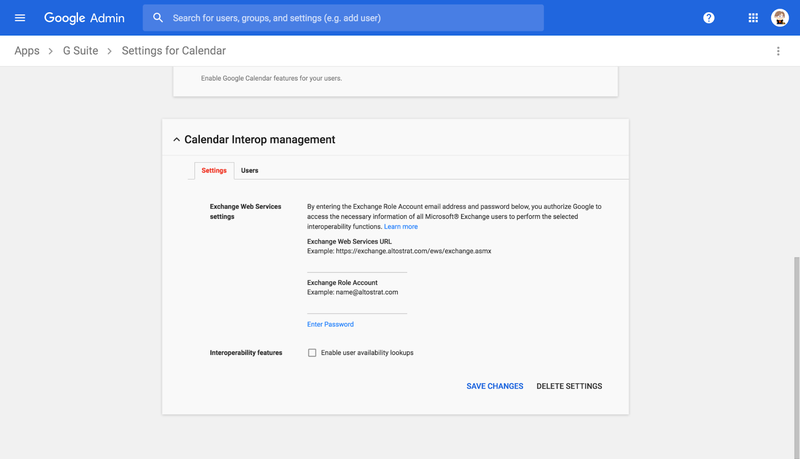 From there, you can set up interoperability between Google Calendar and Microsoft Exchange using our robust setup guide in the Help Center. We’ve built a new interoperability troubleshooting tool that allows administrators to understand the status of the setup with one click. If everything’s working as expected, the tool will let you know. If something’s amiss, it will display a detailed human-readable error to help you pinpoint the root cause of the issue. We’re also exposing interoperability-related logs in the reporting section in Admin console so that admins can track interoperability-related successes and failures for each user separately. Admins who have already set up Calendar interoperability will want to migrate to this new setup. Check out the Help Center for detailed steps on how to migrate. For more information on Calendar Interop and how to get started, visit the Help Center. This entry was posted in Apps Feed Blog and tagged apps, Google Calendar, Rapid Release, Scheduled Release on July 31, 2017 by Jane Smith. Beginning in August 2017, DoubleClick Campaign Manager (DCM) will no longer export standard tags for placements larger than 1x1. This is the next step in a phased rollout of changes aimed at aligning DCM's impression counting methodology with the latest Interactive Advertising Bureau and Media Rating Council guidelines. A full overview of these changes can be found in the DCM partner help center. How will this affect DCM/DFA Reporting and Trafficking API users? On August 22, 2017, the API's placements.generatetags endpoint will stop returning standard tags (PLACEMENT_TAG_STANDARD) for non-1x1 placements. Users will still be allowed to include this tag format in all generatetag requests without error, however responses will only contain standard tag data for 1x1 placements. This will be a retroactive change affecting all API versions. What can API users do to prepare? Existing non-1x1 placements trafficked using standard tags will continue to serve until October 2017. Any such placements which are part of a campaign ending later than this must be re-trafficked using an alternative tag format. Instructions for identifying these placements can be found in the DCM partner help center. Questions about this or anything else DCM API related? Contact us via our support forum. This entry was posted in Ads Developer Blog and tagged dfa_api on July 31, 2017 by Google Ads Developer Advisor. Imagine walking into a hotel room and having the temperature set just right, your favorite sub-genre of progressive-math-rock playing in the background, and the TV urging you to continue binging on your saved guilty-pleasures watchlist. What if your phone's contact book could expand to merge with your spouse's when you're together, so you're never again put in the excruciatingly compromising position of having to ask for your mother-in-law's phone number (which you ought to have had on speed dial, in your favorites, and listed as an emergency contact)? Now imagine a world where you can drive up to an empty driveway or private parking space in a city like New York or San Francisco, and negotiate with that space to rent it out until its owner returns. The common thread among all these scenarios is being able to detect proximity to -- and being able to communicate with -- people, places, and things "near" you. At I/O this year, we spoke about a refresh to the Nearby Connections API that can provide high bandwidth, low latency, encrypted data transfers between nearby devices in a fully-offline P2P manner. Today we're announcing the availability of this API across all Android devices running Google Play services 11.0 and up. Nearby Connections uses WiFi, Bluetooth LE & Classic Bluetooth under the hood to discover and establish connections to nearby devices. It abstracts away the inherent complexity of these radios by leveraging the strengths of each, while circumventing their respective weaknesses. Aside from the obvious advantage of sidestepping the pain of dealing with the vagaries of these radios across different OS versions and devices, this abstraction enables seamlessly upgrading the bandwidth of a connection by switching between the radios as and when it makes sense, as well as getting invisible over-the-air updates to use new radio technology as it becomes available -- with no change whatsoever in the application code. Star: Useful for creating 1:N topologies where there's a centralized device that others are especially interested in. For example, the host of an offline game, or the teacher's device in a classroom quiz app. Cluster: Useful for creating M:N topologies that allow for creating looser mesh-like networks. For example, a classroom app that supports forming ad-hoc project groups for realtime collaboration, or an offline hyper-proximity-based chat app. The Weather Channel is building on-demand mesh networks in data-deficient areas to spread urgent weather warnings. GameInsight is using Nearby Connections to not only find nearby players, but also to run entire games offline. 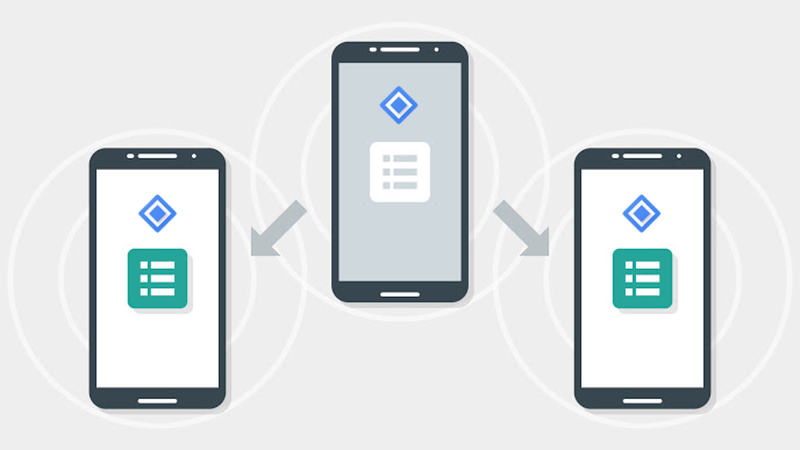 Android TV is building a remote control app (powered by Nearby Connections) to simplify initial setup, and to enable subsequent second screen experiences. Now that the API is publicly available, we can't wait to see how you will use Nearby Connections in your applications. To get started, visit our developer site, check our code samples, and post any questions you have on Stackoverflow (tagged with google-nearby). To stay up to date on the latest Android Nearby offerings (and our other Context-related APIs), please subscribe to our mailing list. This entry was posted in Android Developers Blog and tagged Android, Bluetooth, multiplayer, nearby, offline, P2P, wifi on July 31, 2017 by Android Developers. To all the Gboard fans out there: we’re adding some clutch additions to your favorite keyboard companion. 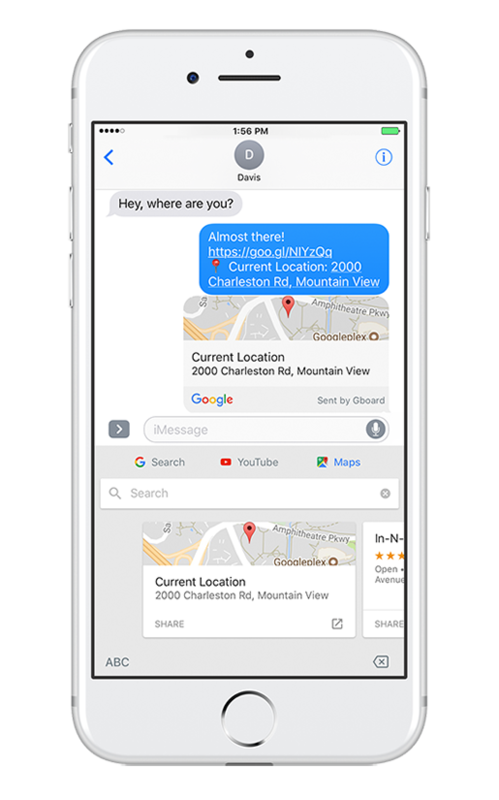 Now with a tap of the G button, you’ll have access to both Maps and YouTube, making it easier than ever to share location and video content in any messaging app. Whether you’re coordinating a rendezvous point at the park or dinner plans at a nearby restaurant, meeting up with friends and family has never been easier. Just tap the G button then “Maps” to share your current location or a local address. You’ll also see a new “YouTube” tab to make it easier to send YouTube videos—like this toddler busting his brother out of a crib or classics like Charlie bit my finger—right from Gboard. For you artists (or doodlers! 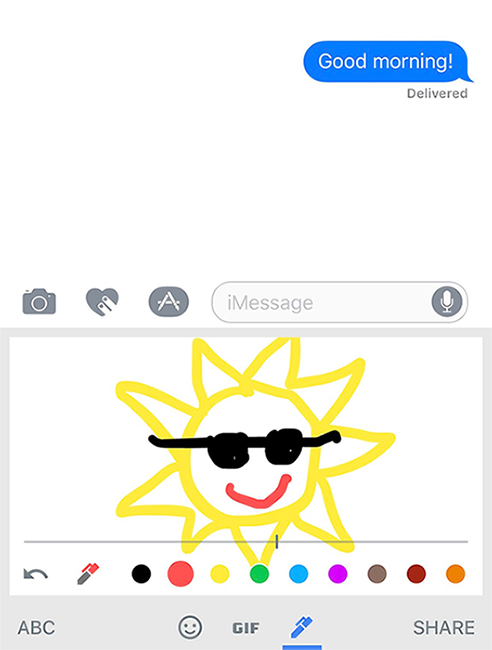 ), you can now use our new Ink feature to draw and share your creations right from your keyboard. Just tap on the emoji button followed by the pen icon and get to to work! And as an added bonus, we now support three new languages: Arabic, Hebrew and Farsi. 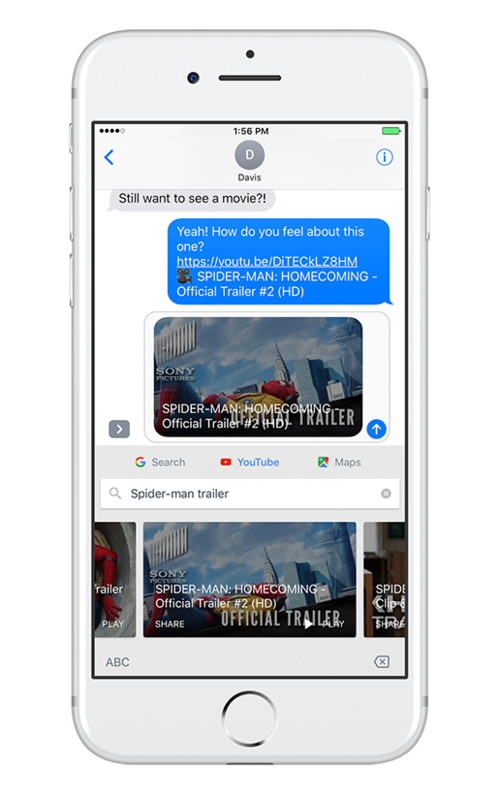 To start using these updates, make sure you’ve got the latest version of Gboard for iPhone. We’re always working on new features and languages, so please keep sharing your feedback in the App Store. This entry was posted in Inside Search Blog and tagged Google Search, Seach, Search, Search Engine on July 31, 2017 by Alan Ni. This entry was posted in Official Google Blog and tagged Search on July 31, 2017 by Alan Ni. Today, we’re making it easier than ever for Canadians to find incredible homegrown talent on YouTube, with the launch of YouTube Spotlight Canada. This new hub for Canadian content will showcase Canada’s top stars in both French and English, and offer one more way to discover emerging Canadian talent. Every month, we’ll highlight the creators and the videos that have got Canada clicking, watching and sharing. We’ll introduce you to new Canadian stories, perspectives and personalities. And we’ll share themed playlists to help you explore new topics and trends. Our first month on YouTube Spotlight Canada is a celebration of the best of the true north, strong and free. Meet the country’s favourite YouTubers, check out highlights from Canada 150 celebrations, relive moments in Canadian history and dive into an incredible roster of indigenous music artists. This week, we’re also launching the popular Creator on the Rise feature in Canada. Creator on the Rise will identify Canadian creators who are growing rapidly and showcase their videos in the Trending tab on YouTube, helping them build an even bigger audience. Every week we’ll bring you a new creator to keep your eye on. Canada’s YouTubers are part of a new generation of Canadian artists growing up online, and finding fans both at home and around the world. YouTube’s open model and global scale reduces the cost of getting content to international markets. As a result, 90% of views on Canadian channels come from outside of Canada, which is higher than any other country on the platform. By lowering barriers to entry, it’s become a powerful platform for creators in Canada to get their voice heard. We hope that you’ll visit the YouTube Spotlight Canada channel (don’t forget to subscribe!) and get to know the Canadians who are taking the world by storm. This entry was posted in Google Canada Blog on July 31, 2017 by Aaron Canada. This week, Vancouver, Canada hosts the 2017 Annual Meeting of the Association for Computational Linguistics (ACL 2017), the premier conference in the field of natural language understanding, covering a broad spectrum of diverse research areas that are concerned with computational approaches to natural language. As a leader in natural language processing & understanding and a Platinum sponsor of ACL 2017, Google will be on hand to showcase research interests that include syntax, semantics, discourse, conversation, multilingual modeling, sentiment analysis, question answering, summarization, and generally building better systems using labeled and unlabeled data, state-of-the-art modeling and learning from indirect supervision. If you’re attending ACL 2017, we hope that you’ll stop by the Google booth to check out some demos, meet our researchers and discuss projects and opportunities at Google that go into solving interesting problems for billions of people. Learn more about the Google research being presented at ACL 2017 below (Googlers highlighted in blue). This entry was posted in Research Blog and tagged ACL, conference, conferences, Natural Language Processing, Natural Language Understanding, Publications, Research on July 30, 2017 by Research Blog. Today we’re excited to announce that the Google Slides API has been added as an Advanced API to AdWords scripts. Our Advanced APIs allow you to work with other Google services within the scripts you write. The Google Slides API allows you to create and write presentations programmatically, and with AdWords scripts it can be used to publish your campaign data in a ready-to-be-shown format. To learn more about using the Google Slides API in your scripts, please refer to our guide to working with Advanced APIs and code snippets. We encourage you to try Slides and our other Advanced APIs and let us know of other APIs you would like to see added. As always, please leave feedback on our forum so that we may handle bugs and improve usability. This entry was posted in Ads Developer Blog and tagged adwords_scripts on July 28, 2017 by Google Ads Developer Advisor. Welcome to the fifth installment of our blog series “My Path to Google.” These are real stories from Googlers highlighting how they got to Google, what their roles are like, and even some tips on how to prepare for interviews. Today’s post is all about Anastasiya Bortnyk . Read on! Originally I am from a small town in West Ukraine called Lutsk. Early on, I knew that I wanted to run my own business some day (following the example of my father who was an entrepreneur in the IT sector), so I studied International Business at the National University of Kyiv. In addition to my coursework, I was constantly involved in student projects. I also started working part-time in Sales and Marketing for IT companies in Kiev before graduating. What’s your role at Google? I am an Associate Account Strategist within the Google Global Customer Experience team. Day-to-day, I help Google customers resolve any technical issues they face while advertising with our online advertising platform AdWords and help them optimize their return on investment. However, the work is not only about interaction with clients directly. We have lots of different projects to dive into. For example, I am also in charge of Customer Education and am leading Online Mobile Academy, which aims to help our clients adapt to the quickly developing mobile landscape. I really enjoy the freedom we have here at Google. We can each spread ideas, initiate new projects or get involved in existing ones we’re interested in. This is very beneficial in terms of professional and personal development. I really value the amount of learning opportunities I get on a daily basis. What inspires you to come in every day? Google’s culture and diversity inspires me most of all. It’s a pleasure to work with people who are all so interesting and different. There is also a huge variety of different opportunities here which, for me, is crucial because I work best when I can constantly switch up my routine. Being able to shape the job how you see fit really makes it a lot more interesting and rewarding. Can you tell us about your decision to enter the process? Where I come from, my peers and I always thought Google was unreachable, only for genius engineers. I dreamed about working here, but never thought about it too seriously. In my case, it was actually Google who bumped into me. I received a letter to apply for the Google Adcamp program, which was designed specifically for students interested in business and marketing. Thankfully, I was selected to attend and take part in this program. It opened my eyes to what Google was looking for; I saw the roles were reachable, and I definitely wanted to work here! How did the recruitment process go for you? I was contacted very shortly after the AdCamp program, and the process was smooth, yet challenging. I had rounds of interviews, each of which was different in nature. The questions weren’t easy, but they were very interesting. I was not able to come for interviews onsite, so I did them over Google Hangouts. However, at that time I was living in the student dormitory, so I was also worried about that. I asked my roommates to give me privacy, and I even set up a cool background, but right at the end of one of the interviews, my internet failed, so I had to do half of the interview without video. It was a disaster back then, but in hindsight, it’s pretty funny :). What do you wish you’d known when you started the process? I wish I knew back then that Google is not only about programming and coding. There are so many opportunities for business or humanities graduates here as well. If I had known that before, it would have changed my perception much earlier. Can you tell us more about the resources you used to prep? I was lucky to attend AdCamp because it gave me a lot of insight into Google and how to get hired here. We had sessions telling us about the recruitment process, and we even had a mock interview. However, before interviewing, I also researched all Google blogs, read articles about interviews, and of course stories of people who had already interviewed at Google. To finish, do you have any tips you’d like to share with aspiring Googlers? Find and reach out to Googlers if you know any. For me, the most valuable thing was a chance to speak to people working here before starting the process. Not only can they then refer you, but they can also share best practices, give you tips, and tell you more about the job you’ll be applying for. It’s also not a disaster if you initially get rejected. I know people who didn’t make it the first time, but persisted, remained positive, and ended up getting the job later on. Want to follow in Anastasiya’s footsteps? Check out our Students site. This entry was posted in Student Blog and tagged Education, students on July 28, 2017 by Social Life.